Next summer, you and all your so-called friends from Facebook and MySpace will be able to finally meet in a giant arena, where you ill be able to play dating games, compete against each other in Guitar Hero or Lacrosse, listen to live bands, or check out the modeling contest. The event will be called ArenaFest, and will eventually be held at 50 major sports arenas around the country. Next summer, it will start with 10 arenas in places like Dallas, Detroit, Cleveland, Phoenix, and Anaheim. ArenaFest will have several draws, including live sports, live music, and live contests. John Ossenmacher, CEO of ArenaWorks Entertainment, which operates ArenaFest, calls it ” our version of live social networking.” People who go will be able to interact with their friends on Facebook and MySpace. And their friends on those social networks will be able to interact with what’s going on inside the arena. 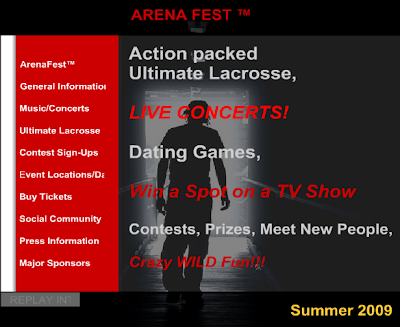 At ArenaFest, the audience will be encouraged to participate themselves through a variety of contest stations, including a Lacrosse Challenge, Guitar Hero, Next Top Model (to lure the ladies), Dodgeball, and Break Dancing (yes, break dancing). There will also be some sort of dating game. All of this will cost just $27.50 per ticket, and the whole thing will be repeated weekly throughout the summer at the same venues to encourage the high school and college crowd to keep coming back. Search And Find Love Search engine which indexes web pages and allow you to use the quick view of the result page to find information about the website.